ABC ISSUE 380 – OUT NOW! The star of the show was the Scania K450 luxury coach from Rick Palmer of Palmers Coaches. Collaborating with Coach Concepts, with this vehicle you didn’t have to hop onboard or check out the features to be immediately impressed. With the nickname ‘Pure Class’ and a colour scheme made to stand out in a crowd, a test drive was certainly on my list to see if it was as impressive as its great-looking exterior. "At every step, Coach Concepts talked about what our options were, and were very happy to change things right up until the 11th hour. "I love the shape, it’s an Australian-built coach and I could be there every week to look at it as it was getting built. Coach Concepts were fine with that. I just popped in to have look, and to be honest there was never any issue with any part of things as I saw it getting built. I can’t fault them". "It was not just the looks, it was the practicality. Even to the extent of the guide’s microphone plug; it’s right next to the guide, not on the dash. It’s the little details that make this coach what it is." "This is our first steerable tag, absolutely amazing. After driving the steerable tag I never want to go back", Palmer continues. Scania account manager Brian Thompson explains: "Build time was three months. We placed the order in Adelaide in June and we had a timeframe for the bus expo and Coach Concept met it, it’s a totally new coach for them with the new front. The whole vehicle just looks smart." I am instantly confident driving this vehicle. It’s a very easy drive. The steering is great; not too light, and it feels like a large car or a big luxury four-wheel drive. The road noise is light to not existent at all, even at speeds up to 100km/h. I cruised along the freeway after leaving the depot and the Scania sits effortlessly on 1300rpm at 100km/h; plenty of untapped power there. This DC13 /147 in-line 6-cylinder has 450hp/ 331kW at 1900rpm and is matched with a Scania 12-speed Opticruise GRS895R transmission. 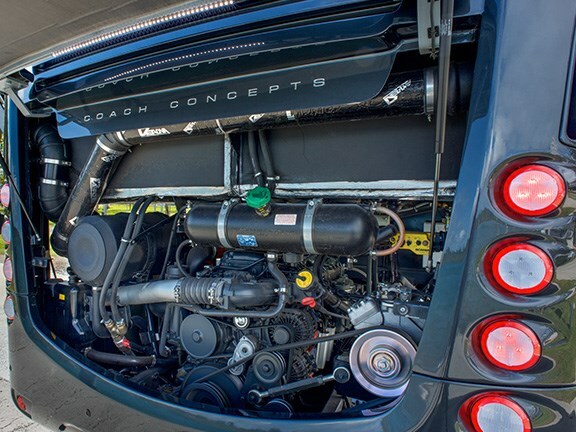 It’s the perfect combination for this coach, although it was set in economy mode and didn’t utilise all of its full power – but you can certainly feel the torque of this engine. As with all Scanias, the braking system has EBS, ABS and electronic stability program (ESP) and brakes effortlessly. All bases are covered with safety here. With its steerable axle tag, you could be fooled by the true length of this coach as it steers confidently in and out of traffic. The turning circle is impressive in tight situations. Originally, Palmer ordered a timber steering wheel but changed it to leather, which I feel makes for a more comfortable, luxurious drive. On the steering wheel is cruise control and downhill descent. This eliminates overrun and can also be used as a speed limiter, so when you are going through a town you can just sit at 50km/h and know you are not going to go over. I didn’t have the opportunity to use this feature as I did more flat, city driving in traffic, but can imagine this would be a great feature when entering and going through some of the hilly regional areas and smaller towns. 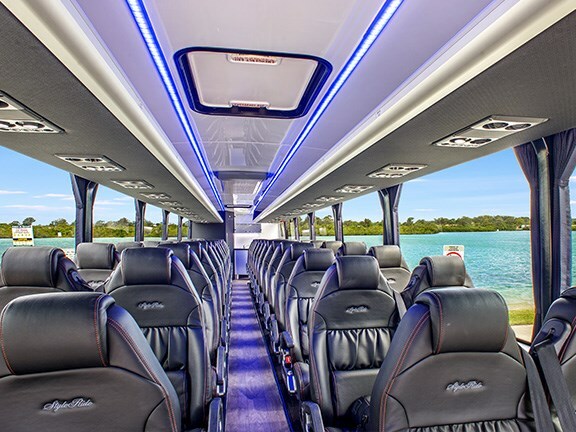 Any driver would love to drive this coach, but checking out how luxurious things are for the passengers – they can enjoy a glass of sparkling courtesy of an in-built bar – I certainly wouldn’t mind that glass of champagne on tour. I could find no negatives, not even personal preference of setup from a driver’s perspective. "The concept with the drinking on board was: if we go and do a sunset tour, you can pull up and serve drinks, passengers can comfortably sit on board to watch the view or leave the coach," Thompson adds. "It’s just that next step to what’s around at the moment. It means Rick’s tours can have a point of difference." Looking for any negatives in this purchase, Palmer laughs: "There is only one problem with this vehicle. "Anyone can build a coach but we wanted to give the customers something to go, ‘Wow look at this!" "I pulled up the other day at a McDonalds to pick up a couple of the guys, and they said they thought Alice Cooper was coming to pick them up. When asked about what green technologies the chassis offers, Thompson says the latest Scania technology, including selective catalytic reduction (SCR) and Euro 6, put it at the forefront. 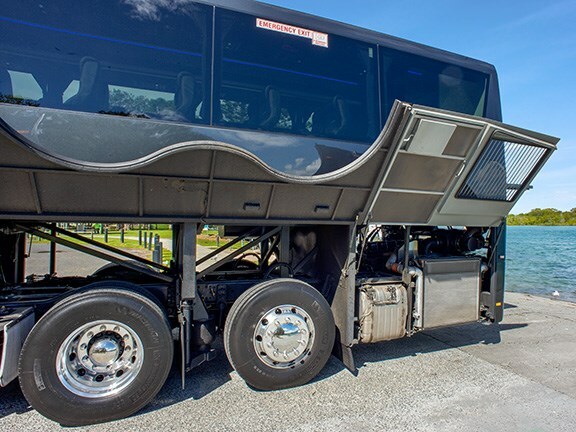 "The reduction in carbon dioxide readings in comparison to a Euro 5 is that this coach produces 1.3 compared to 5.4, so with the E6 technology the fuel consumption is greatly reduced," he says. "We were standing beside it and we didn’t even know it was running. The internal quietness is ideal for the corporate market, and you just don’t feel like you’re in a bus." Palmer is adamant that being a Scania gives him confidence, which is an important factor because of the terrain and conditions his business operates in. "Out west we are forgotten, no one cares. But with the Scania maintenance program, if something goes wrong, I’m covered. That vehicle gets towed in and I don’t have to pay a thing. "Where we are, it’s harsh country. I’ve seen the temperature coming off the ground at 57 degrees, 45-48 is common, and winter can be -3. I’ve got inside a coach getting ready to pick the workers up and it says 53 degrees inside the coach – it’s savage." Asked how the Scania maintenance program works, Palmer says: "Simple. If it breaks, I send it back". "If the vehicle is off the road for longer than 24 hours, Scania assists the operator. 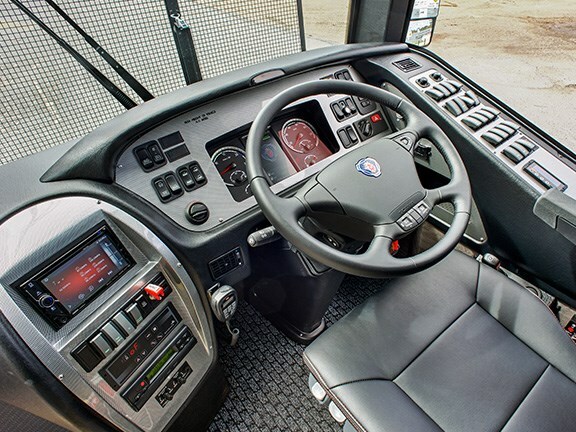 From a Scania point of view, it’s about working in conjunction with the operator. We have service agents throughout country and, with the onboard communicator, Scania can check what needs to be done and be prepared with parts before the coach comes in." "Scania aims to work as a business partner, not as just a chassis supplier to the industry. With the full repair and maintenance contract, preventative maintenance is covered. "Servicing intervals are 45,000-60,000km based on long-distance applications. Many operators are not used to the extended servicing intervals and prefer a smaller interval of 10-20000km. It’s all about what the operator wants. We tailor the schedule to suit the operator." Each week, Palmer receives a free report from the Scania Communicator telematics that shows fuel consumption, drivers’ score including harsh braking and overspeed, kilometres done, and carbon produced. 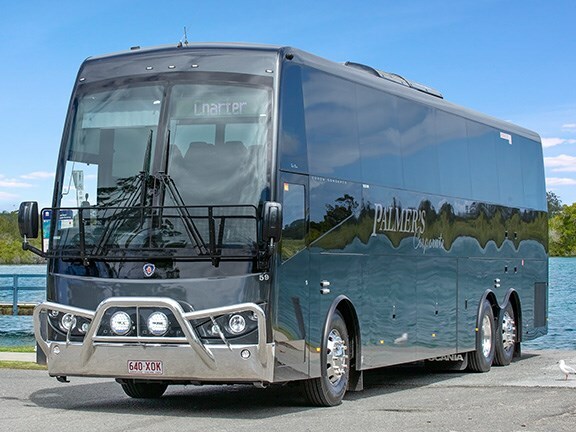 The collaboration between Palmer, Scania and Coach Concepts is one the former is pleased with. He’s proud of the outcome because of the input and changes he was able to make as the build progressed, ensuring the vehicle affectionately known as ‘Pure Class’ not only met, but surpassed, his expectations. A successful collaboration such as this one maintains the commitment and relationship between the owner, the chassis supplier and coach builder. When interviewed, Palmer and Thompson both confirmed that Pure Class number two is ordered and on its way. With an obviously great-looking coach, Pure Class seems an appropriate name, but this moniker was really the second choice that came about by accident, Palmer says. "We were going to call the coach ‘Son of a Gun’; this is actually the name of the paint colour we used, but we drove the coach through town and one of my friends said he just saw the coach and remarked, ‘That’s just pure class,’ and the name stuck. Palmer is obviously happy with his latest luxury acquisition but it’s always interesting to delve into company’s history. Palmer says he started Palmers Coaches five years ago with his wife Kim, a process that spanned time living in a caravan to finance the business. "I was out at the mines and gas fields out west, and one of the supervisors said they needed a bus to transport the workers. I thought that, with my background, I could do that. "I rang my wife and said we needed to buy a bus. Our first coach was a Denning. We mortgaged the house and kicked off with one coach. We rented out the house as we had a caravan – which we had always planned to travel around Australia in but never had – that we lived in for two months. Kim got a job as a cleaner at the golf course and we ended up staying in the caravan at the course for 18 months. "By January we bought another coach and a mini-bus. When we got a few more vehicles, we rented a house for the boys coming out to drive. They were all guys I had worked with in the industry over the years. "Rent in mining towns is very expensive. Within two years we bought a farm out there and within five years at our peak we had 33 vehicles. Palmer says he always had a five-year plan to take into account the life cycle of the mining industry. "We thought in five years the mining would start to slow down, and I needed a plan to come back to, which was starting the business on the Gold Coast. When the mining started to slow, some of the coaches came back here. Usually we have 15 coaches here, but that can vary, and about the same number are still at the mines." For Palmer, the Gold Coast and the luxury Scania coach is a long way away from the harsh conditions of the mines. "Every time I enter the coach it blows my mind that we could achieve this level of vehicle after only five years of business." Palmer seems to have the business at a standard that he is content with – from vehicles to clients to staff members. "With the coaches now, our theory is quality over quantity," he says. "We have a contract out there with one of the gas sites for three years plus two, another contract with a mine, and the charter with schools has really taken off out there. "With the two depots now we have coaches based at Roma, Miles, Toowoomba and some at Chinchilla and the Gold Coast. Everything flows in nicely. I can have a driver kick off from Surat or St George and he will drive to Toowoomba, then another driver takes over. "The drivers aren’t made to do the whole lot – they are only doing day runs. The only problem we do have is when something is going on at the mines and it booms, many of the drivers go for the money at the mines. You can make great money. "We’ve built the business on good relationships with our customers, we communicate – out there you’re on your own – so good relationships are very important." There are 32 employees currently at Palmers Coaches, with safety a number-one priority for workers and customers. Customer service, quality of service and reliability are also important to Palmer. "We couldn’t be where we are today without the workers that we have. It’s not just about me building the company, it’s about everyone building the company. "Anyone can buy a beautiful coach but it’s the driver that makes it work. If you have a goose up the front, you may as well have a Datsun. "Our general manager is Bruce Adams. I had worked for him previously when he was a general manager at Coach Link and now he works for me, but we still have a rapport that anything he says I listen to. I am normally the ideas man and Bruce is the one that says, ‘Let’s think about that one.’"
"A team that gels is also very important, if the team doesn’t gel, everything else falls apart." "Our company has a golden rule for our drivers: if you’re not comfortable going in – don’t! Simple as that. Just don’t do it. All that type of driver pressure causes is putting coaches off the road for repairs. "We will never knock a driver. In the country, drivers have to worry about cows, kangaroos and road trucks, but in the Gold Coast drivers have to worry about everything – getting in and out of some motels and clearance is a major issue, they have a lot to deal with." The rapid growth and success of Palmers Coaches, epitomised by the purchase of this eye-catching Scania, is testament to Palmer’s attitude and dedication to the industry. "Ever since I was two years old I wanted to drive coaches; they are my life. My father drove coaches but passed away in 2009. It would have been great for him to see all of this – he would have loved being part of it," Rick Palmer concludes.